The Virginia Tech Hokies football team; represents Virginia Polytechnic Institute and State University in the sport of American football. The Hokies compete in the Football Bowl Subdivision (FBS) of the National Collegiate Athletic Association (NCAA) and the Coastal Division of the Atlantic Coast Conference. They previously competed in the Big East. Their home games are played at Lane Stadium, located in Blacksburg, Virginia with a seating capacity of over 65,000 fans. Lane Stadium is considered to be one of the loudest stadiums in the country, being voted number one in ESPN's "Top 20 Scariest Places to Play". Also, it was recognized in 2005 by Rivals.com as having the best home-field advantage in the country. It is currently the 31st largest stadium in college football. The Hokies currently have the longest official bowl game streak in the country, having participated in the postseason every year since 1993. Florida State has a longer current streak, but due to NCAA sanctions, officially, FSU's streak ended in 2006. In 121 seasons, the Hokies have won over 700 games, appeared in 29 bowl games and played in the 2000 BCS National Championship. The program has also claimed ten conference titles (2 South Atlantic, 1 Southern, 3 Big East & 4 ACC ) and produced eight All-Americans. The 1909 team claim a southern championship. This is the first season the team was referred to in print as the "Gobblers", which became the official nickname in 1912. In the 1970s, Tech briefly adopted an aggressive passing offense under head coach Charlie Coffey; quarterback Don Strock set virtually every passing record in the Hokies' book and would hold many for thirty years or more. Success, though, remained elusive. In the early 1980s, football coach and athletic director Bill Dooley spearheaded a campaign for a new look and name for the mascot, which debuted at the 1981 football game against Wake Forest. 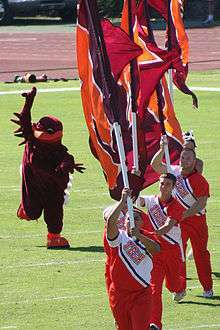 The turkey-like figure was referred to as "the Hokie mascot", "the Hokie", and "the Hokie bird" (derived from the "Old Hokie" cheer), which resulted in changing the official designation of the Virginia Tech mascot to the Hokies. Dooley led the Hokies to the program's first-ever bowl win, in the 1986 Peach Bowl over NC State, but he also earned the program NCAA sanctions that led to his resignation that very offseason (after which he promptly sued the school). Though many hoped for recently departed Maryland coach Bobby Ross, athletic director Dutch Baughman turned to Hokie alumnus and defensive back from 1966 to 1968, Frank Beamer. Beamer had worked his way up the assistant coaching ladder since his 1969 graduation before spending six seasons in the head job at Murray State. Among the assistants Beamer brought with him from the Racers was linebackers coach Bud Foster, who had joined Beamer's first Murray State staff as a graduate assistant immediately upon his own graduation there. Virginia Tech joined the Big East Conference for football play in 1991 (later joined for all sports in 2000). The 13th ranked Hokies defeated the 9th ranked Texas Longhorns in the 1995 Sugar Bowl in New Orleans, Louisiana. Virginia Tech's most successful football season was in 1999. The Hokies, led by redshirt freshman quarterback Michael Vick went 11–0 through the regular season. On November 3, the Hokies came from behind to win over the West Virginia Mountaineers when Vick led a desperate last minute drive that culminated in a dramatic Shayne Graham game winning field goal. The 22–20 victory has since become known as the "Miracle in Morgantown." On January 4, 2000, the Hokies faced the Florida State Seminoles in the 2000 Sugar Bowl for the national championship. A back and forth game, the Hokies trailed 28–7 late in the second quarter but came back to take a 29–28 lead at the start of the fourth. However, they were not able to hold on and the Seminoles won 46–29. At the start of the 2004 season, the Hokies faced the #1 and eventual national champion USC Trojans in the BCA Classic played at FedEx Field in Landover, Maryland. The Hokies kept the game close, but eventually lost 24–13. The regular season ended with the Hokies winning the ACC championship in their first year in the conference and a return to the Sugar Bowl and a match-up with the Auburn Tigers. Auburn, the SEC champion and one of three undefeated teams (USC and Oklahoma being the other two), took a 16–0 lead into the fourth quarter. Led by senior quarterback Bryan Randall, the Hokies scored 13 points but fell just short of the comeback when the Tigers recovered an onside kick and ran out the clock. After twenty-nine seasons as head coach of Virginia Tech, legendary coach Frank Beamer retired following the conclusion of the 2015 season. He coached the Hokies to 23 consecutive postseason games, a national championship appearance and seven conference championship titles. Beamer now serves on the staff of the Virginia Tech athletic director. Memphis Head Coach Justin Fuente was named head coach of the Virginia Tech Hokies following the retirement of legendary coach Frank Beamer. The Hokies finished 9-3 in Fuente's first season as head coach and won their sixth Coastal Division title. They will face Clemson in the ACC Championship Game. During Beamer's tenure at Virginia Tech, putting points on the scoreboard has become a full team effort with the offensive, defensive and special teams units. Often when the team scores one or more non-offensive touchdowns, the style of play is described as "Beamerball". Since Beamer's first season in 1987, a player at every position on the defensive unit has scored at least one touchdown, and 35 different players have scored touchdowns on Virginia Tech's special teams. The 1905 team, though independent, went 9–1 and lost its only game to northern Navy. It won all its southern games and scored a victory over Army and therefore claims a Southern championship. Virginia Tech has appeared in the ACC Championship Game as the winner of the Coastal Division six times. The 2004 team entered the inaugural ACC championship game as heavy favorites and went on to become the Atlantic Division winner. In 2005, Virginia Tech again became coastal champs, but was defeated in the ACC Championship by Florida State. During the 2007 season, the Hokies once again took the Coastal division to set up a rematch of their earlier loss to Boston College. Virginia Tech prevailed 30–16. History repeated itself in 2008, when the Hokies defeated Boston College by a score of 30–12 after having lost to the Eagles during the regular season. In 2010 Virginia Tech went undefeated in league play, defeating Atlantic Division winner Florida State in the league championship game in Charlotte, North Carolina, 44–33. In 2011 Virginia Tech lost to Clemson for a 2nd time that season, their only two season losses. Virginia Tech has played in 29 bowl games. The Hokies have appeared in several Gator, Peach, Sugar, and Orange Bowls. Their overall record in bowl games is 12–17. ↑ "Football :: Lane Stadium/Worsham Field". hokiesports.com. Retrieved 2014-08-25. ↑ "The Brand Guide: Virginia Tech Identity Standards and Style Guide" (PDF). Virginia Tech. 2015-02-01. p. 10. Retrieved 2015-11-04. ↑ Lavender, David (2005-08-21). "No place like home". Retrieved 2006-07-01. ↑ Pieper, Lindsay (2006-09-02). "From wheat to Worsham: The history of Lane". Collegiate Times. Archived from the original on 2007-09-27. Retrieved 2007-07-28. ↑ "Virginia Tech Football Past Schedules – 1892". hokiesports.com. Retrieved 2007-07-28. ↑ "What is a Hokie?". University Relations, Virginia Tech. 2006. 1 2 "From The Beginning ... To The Beamer Era". ↑ "Records Show Peake Leader". Sarasota Herald-Tribune. December 2, 1927. ↑ "Football". hokiesports.com. 1947-01-01. Retrieved 2014-08-25. ↑ Colston, Chris. Tales from the Virginia Tech Sidelines. Sports Publishing LLC, 2003. Page 26. ↑ "Football :: Schedule". hokiesports.com. Retrieved 2014-08-25. ↑ "Virginia Tech Hokies Football, Basketball, and Recruiting". TechSideline.com. 2014-08-20. Retrieved 2014-08-25. ↑ Schlabach, Mark (2006-11-07). "Virginia Tech Sacks Vick". The Washington Post. 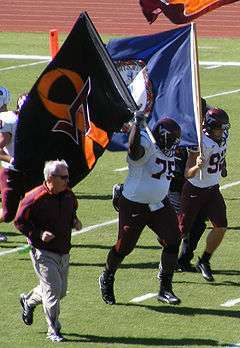 ↑ http://www.hokiesports.com/football/notes/20111022.pdf "2011 VT Football Game Notes"
↑ "Virginia Tech Hokies Football Schedules and Future Schedules". fbschedules.com. Retrieved 2014-08-06.